923 Cinnamon Beach invites you to just kick your shoes off and come on in. 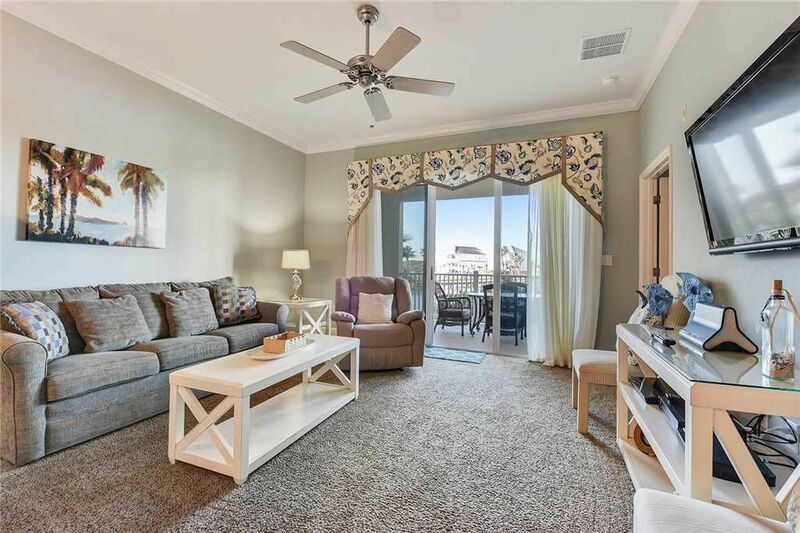 This condo features a huge 47-inch HDTV in the living room and 32-inch HDTVs in all 3 bedrooms. The sensory combination - and fantastic resort facilities - ensures you’ll sleep well in your soft pillow-top king bed. From your generously sized balcony, you can see the resort and sunset, and take deep breaths of the balmy sea air. The interior decoration is luxurious and tasteful, leaving lots of open space. Walking through the entry foyer, a wide hall leads into your large, open-plan living area. Here, a fully equipped new kitchen stirs even disinterested chefs to make magic in these creative surrounds. Gorgeous cabinetry shines against new appliances and polished granite counter tops. Every kitchen staple is included and the resort view is an ideal backdrop. Hungry helpers can lean against the L-shaped bar counter as food travels either to the adjacent dining table or outdoor balcony. When needed, the dining table is just what you want for a light meal on a hot day. As the perfect spot in which to relax in the evenings, your living room area is immediately inviting. A comfy new couch and an armchair face a large 47-inch HDTV and coffee tables. Two large lamps provide good reading light after the sun goes down - and the sunset is visible from your living room or the balcony. The couch includes an air mattress for a super comfy queen bed. The master suite is regal. Bedside lamps sit nicely next to a king-sized bed with ornate headboard and inviting linens. The master bedroom has a 32-inch HDTV, a DVD player and a private master bathroom. The master bathroom has both a glass-enclosed shower and Jacuzzi-style bathtub. Light tiles and paintwork increase the sense of space, as does the large vanity mirror. At the opposite end of the condo are bedrooms two and three. Sharing a full bathroom they feature a queen bed with antiqued white wooden furniture and two twin beds. Both have their own 32-inch HDTV and DVD players - certain to keep all ages and interests happy when choosing a movie to watch. You’ll love the convenience of your in-suite laundry facilities and high-speed Internet access. When not sleeping or playing on the beach, the view from your balcony is a constant delight. Utterly scenic, it leaves lots to contemplate. A large lake, golf course beyond, and winding intra-coastal waterways in the distance set a very tropical stage. Very nice. We will be back next year! I loved this unit. It was actually bigger then I expected. It fit the family perfectly. It’s a really beautiful and comfortable condo! I was disappointed how far the pool was from the condo. It’s a bit of a walk and it’s outside of the condo area and in the neighborhood- kind of like a neighborhood association. Same with with gym- nice facility, but really too small for the whole area to use. It was always really crowded. We also were woken up at 730 am the first day by construction work and had some future renters try to barge in and see the space while we were there. There is no safety latch on the door. The condo itself is really spacious, clean, and comfortable. The kitchen had everything we needed and we cooked a lot. We are happy to hear that you and your family enjoyed your stay at Cinnamon Beach. We do however apologize for any inconveniences that you faced during your vacation. Our goal is to continuously and consistently provide our guests with an amazing vacationing rental experience. We again apologize in regards to the construction work and the unfortunate walk-in. Guest comfort is important to us and we are completely committed to improving in the areas we seemed to have fallen short. We understand your frustrations and would like you to know that this is not a typical representation of our customer service. We appreciate your feedback and honesty and hope that you continue to book with us. Our stay was great. The condo was beautiful and so easy to check in and out of. No hassles whatsoever! The property was as advertised and the pictures of the property matched in person what we saw on the booking site and on the Hospitality mobile app. The mobile app came in very handy for getting quick info about the property and the surrounding area. The contact info was perfect as we got response when we call the emergency number displayed. We will be booking again as the overall experience was very good. My only true complaint would be the sleeper sofa needs updating. There is NO cushion in the mattress and it leans forward when open. May I also suggest you supply enough toilet paper for the entire visit. This is a very "inexpensive" "necessary" item. There was no need for us to go to the store, since we were not planning to cook. Something that minor caused a major inconvenience. Other than those two items, the place was amazing!!! Thanks for allowing us to enjoy ourselves in Daytona in your lovely condo.